Cinderella dressed in yella… None of that in here. We want to take you light years beyond what you can even think is possible inside Double Dutch. Of course, if you have never done it before we want to make sure you get started right so we have extremely detailed instruction on the right way to jump in Double Dutch. We cover everything you could possibly want to know: What type of ropes should you use? How do you turn? How do you enter? And that’s just a snippet of what you’ll learn in the first section. 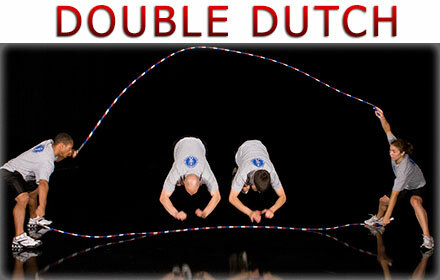 In case you don’t know, Double Dutch involves 3 or more people. Two are turning 2 equal length ropes with a jumper in the middle. Our goal here at Jump Rope Secrets is to make sure you know exactly how everything is done inside rope skipping. Our Double Dutch videos break down all aspects of jumping from individual and partner skills to turner involvement and beyond. We always start out simple and make sure you understand how each skill is done properly. To make sure your learning is as simple as possible, we also walk through every skill outside the rope, give you all the secrets on how to do a skill, before we show you how it looks inside. Ready to get your Double Dutch on? Check out the previews below to get an overview of the skills you will be mastering in no time!